Did you know that tea is the second most consumed beverage worldwide, after water? While tea brewed in the traditional way is still a dietary staple in many parts of the world, an ever-increasing range of healthy teas in varied forms is now available. Many of these teas offer multiple health benefits. In fact, tea has been widely used throughout history as a therapy for specific health conditions. It has also been credited with lowering the risk of disease, including cancer risk. 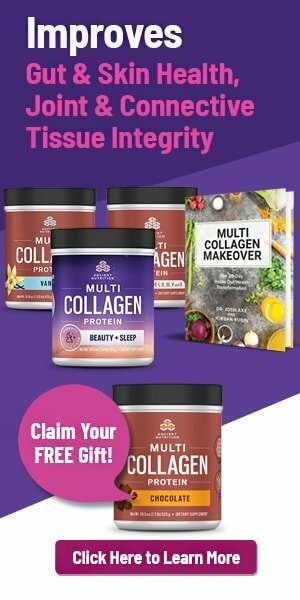 And what do you know – recent scientific and clinical research supports some, if not all, of these very intriguing health claims! 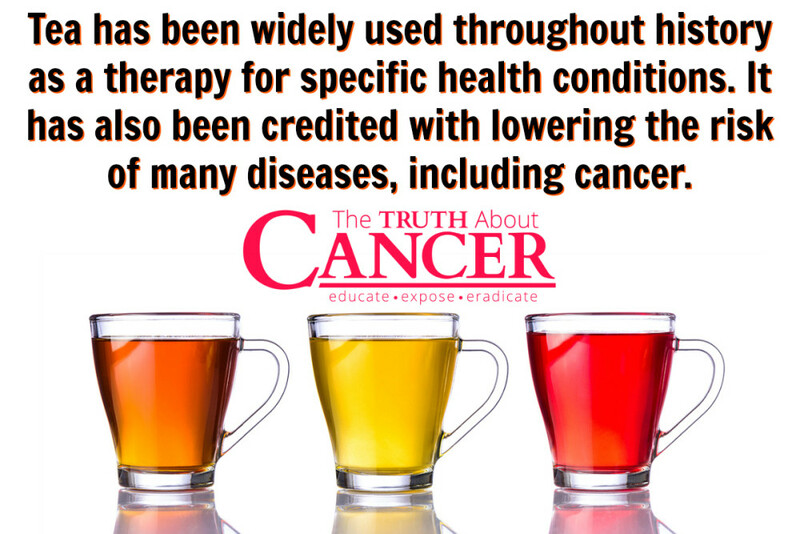 Let’s look at three healthy teas scientific evidence indicates you should be drinking daily to lower your overall risk of getting cancer. Green tea is a very popular beverage in Japan and parts of China. And did you know that green tea, white tea, Oolong tea, and black tea are all made from the same plant, Camellia sinensis? 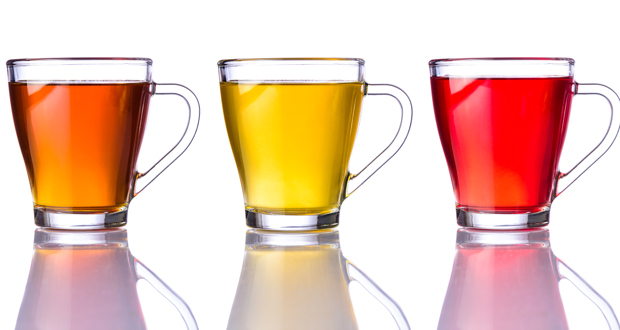 The reason these teas look and taste different is because they’re processed differently. For instance, green tea is made from fresh leaves which are steamed or heated immediately after harvest. Black tea receives more processing, making it the most oxidized of the three. Green tea contains many naturally occurring “bioactive” compounds – in other words, natural compounds that act in specific ways on our body. Bioactive compounds in green tea include caffeine, tea polyphenols, and so-called “volatile” compounds that contribute to this tea’s familiar odor and taste. Tea polyphenols are bioactive plant compounds that include catechins, which are believed to be responsible for many of the promising health benefits attributed to green tea. The most active and abundant catechin in green tea is known as epigallocatechin-3-gallate (EGCG). Epigallocatechin (ECG) is another catechin. Both have high antioxidant activity – together they act to neutralize many harmful “free radicals” in our body. A free radical is a highly reactive molecule that can damage important biological structures in your body’s cells, such as DNA and proteins. Like vitamin C and vitamin E, antioxidants such as EGCG and ECG limit the damage free radicals cause by chemically neutralizing them. Although many of these anti-cancer benefits are believed to be the result of the strong antioxidant activity (and other bioactive properties) of green tea polyphenols such as EGCG and ECG, the exact mechanisms by which green tea acts to prevent cancer have not yet been clearly identified. While regular green tea consumption is recommended for lowering cancer risk, its effectiveness in people who are already suffering from various forms of cancer is unclear at present. However, because of its lack of toxicity and numerous anti-cancer properties, it is both acceptable and advisable to consume two to three cups of green tea daily. It would be reasonable to expect that a preventive therapy that can help to lower cancer risk might also help prevent the progression of the disease. The lowly dandelion weed has been used for centuries as an alternative herbal remedy to treat infections, lower inflammation, increase bile flow and correct liver problems. It is also considered to be an effective mild laxative, along with improving appetite and digestion. Recently, very promising studies have shown that extracts of the dandelion flower, leaves, and root – all of which are used to make healthy teas – contain bioactive compounds with potential anti-cancer properties. In a very exciting result for both cancer therapists and patients, dandelion root extract was found to kill aggressive, treatment-resistant human pancreatic cancer cells without harming non-cancerous cells. Another cancer that is highly resistant to treatment is chronic myelomonocytic leukemia (CMML). Dandelion root extract was shown to selectively kill CMML cells, suggesting that dandelion root extract has great potential as an effective alternative to conventional CMML treatment with toxic anti-cancer drugs. The lethal and fast-acting skin cancer melanoma is known to be resistant to immunotherapy, radiation therapy, and chemotherapy. The only known way to treat it is surgical removal after early detection. Promisingly, dandelion root extract has been shown to kill human melanoma cells, once again without harming non-cancerous cells. It’s important to remember that these studies on dandelion root extract have all been carried out in isolated cancer cells in laboratory conditions. The only way to know how effective dandelion root extract can be against various forms of cancer is to test it in human clinical trials. There is currently one human clinical trial underway at the University of Windsor in Canada where a research team is testing a potent form of dandelion root extract on a group of 30 patients with end-stage, blood-related cancers. 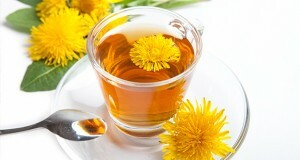 Until more research results are available, health experts say that it’s perfectly fine to drink a cup or two of dandelion flower, leaf, or root tea daily as a preventive therapy, because of its near-complete lack of toxicity. However, if you’re currently being treated for a health condition, you should play it safe and consult your physician before adding these healthy teas to your daily diet. Did you know that up to 100 species of mushrooms are being studied for their health-promoting benefits? It seems that some mushrooms contain very potent immune-boosting bioactive compounds. For this reason, health experts believe that mushrooms may one day be useful in preventing, as well as treating, cancer. For instance, the chaga mushroom has been used for many years in folk medicine in Siberia and other parts of Russia, Poland, and many Baltic countries. Chaga is used as a cleansing agent as well as to treat stomach diseases, worms, liver and heart conditions – and even cancer. In recent years, this exotic mushroom – which grows almost exclusively on birch trees and is said to look like a large growth of burnt bark – has been studied closely because of its high nutritional and antioxidant levels. 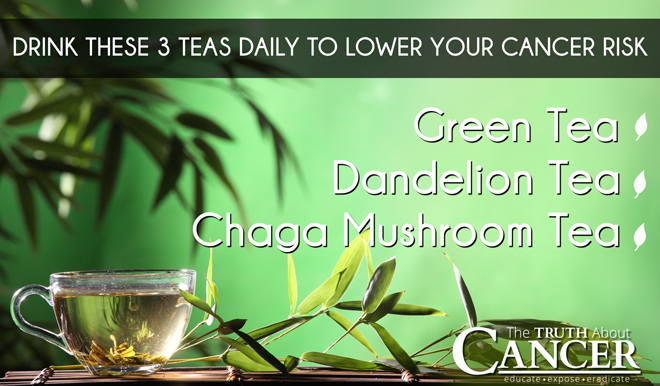 In fact, its popularity has grown to such an extent that you can now buy a healthy tea made from chaga mushrooms. The Chaga Mushroom – An Anti-Cancer Superhero? Chaga mushroom extracts have been shown to kill human lung, glial, and colon cancer cells in laboratory studies without harming normal non-cancerous cells. Further, a bioactive compound obtained from chaga was shown to kill multiple types of colon cancer cells, strongly suggesting that it can be used as a supplement in colon cancer therapy. While these initial results are very promising, clinical trials are still needed to verify chaga’s safety and effectiveness as a potential cancer treatment in humans. Health experts warn that it is not advisable to drink chaga mushroom tea if you are using a blood thinning drug or if you’re on blood sugar-lowering medications. To be on the safe side, be sure to consult your physician before adding this particular healthy tea to your daily diet, especially if you already have a pre-existing health condition. Tea has been widely used throughout history as a therapy for specific health conditions. It has also been credited with lowering the risk of many diseases, including cancer. Green tea contains many naturally occurring “bioactive” compounds (natural compounds that act in specific ways on our body). Green tea contains both EGCG and ECG which help to neutralize many harmful “free radicals” in our body. While regular green tea consumption is recommended for lowering cancer risk, its effectiveness in people who are already suffering from various forms of cancer is unclear at present. However, due to its lack of toxicity and numerous anti-cancer properties, it is generally advisable to consume 2 to 3 cups of green tea daily. Promising recent studies have shown that extracts of the dandelion flower, leaves, and root – all of which are used to make healthy teas – contain bioactive compounds with potential anti-cancer properties. Some mushrooms contain very potent immune-boosting bioactive compounds. 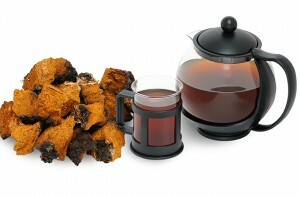 In recent years, the chaga mushroom has been studied closely because of its high nutritional and antioxidant levels. While initial studies are very promising, clinical trials are still needed to verify chaga’s safety and effectiveness as a potential cancer treatment in humans. Health experts warn that it is not advisable to drink chaga mushroom tea if you are using a blood thinning drug or if you’re on blood sugar-lowering medications. Be sure to consult your physician before adding this tea to your daily diet − especially if you already have a pre-existing health condition. The efficacy of dandelion root extract in inducing apoptosis in drug-resistant human melanoma cells. Black, green and white teas are loaded with fluoride, case closed. This site states elsewhere that fluoride can contribute to cancer, especially thyroid cancer. All comments to articles you post, whether they agree with your thesis or not deserve to be considered by the readers, unless, of course, the content is presented in an unsuitable manner. I’ve been very nice and straightforward so far with my two previous comments here. Before you delete this, because it is controversial to your article(This will be your third deletion of me in two days), I now realize that you(Mr. Nair) are either a shill for either the tea or fluoride industry and you have no interest in providing the truth to the people. You’re obviously just another phony hack under the guise of being some knowledgeable “expert”. This is such a “feel good” website because you only show one side of the coin. I don’t believe I’ve ever seen a negative comment yet, a very misleading and “dangerous” practice. Hi typodrive, It may take a few days for a comment to be approved and then posted. Best wishes! does this Essiac tea have flouride? typodrive, Does Organic teas have fluoride? Is it the leaf that has naturally occurring fluoride in it or is it the soil that it is grown in? I thought one tea would be Essiac. Ive been drinkiing it. I bought it for my brother but he never drank it. He died of brain cancer. So sad. Feeding the fear of cancer….. your life is too precious to play it safe and not complete a full regime of treatments. Enjoy tea, water, coffee, wine and other beverages in moderation. Guzzling green tea is not the answer. I’ve been drinking tea since I was about 12, and I got breast cancer… go figure… LOL…. I still enjoy EVERYTHING!!!! Might go and put the kettle on now…. tea time! Exactly, just eat Whole foods – from the earth – nothing man-made! 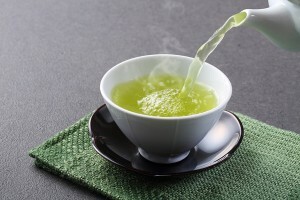 [Green tea is a very popular beverage in Japan and parts of China. And did you know that green tea, white tea, Oolong tea, and black tea are all made from the same plant, Camellia sinensis? The reason these teas look and taste different is because they’re processed differently. For instance, green tea is made from fresh leaves which are steamed or heated immediately after harvest. Black tea receives more processing, making it the most oxidized of the three]. I have been diagnosed with breast cancer and read about Pau D”Arco tea and the info is amazing all the healing properties. I got it at the vitamin shoppe, would you say that the one from the Teaheebo tea club is a purer form? Thank you for posting that it is great to hear a success story with it. I need to drink more of it. Apparently, black and green teas contain high fluoride content from the soil with white tea supposedly containing the least due to its younger leaves that are processed sooner and so have less contact in the soil. I now drink white tea in preference to green having learned this. I have though only used organic tea bags so far for convenience. Does white tea have the same benefits as green tea? I switched to white tea about a year ago, as my naturopath recommended to stop drinking black tea, and I don’t like a lot of strong herbal teas. I guess I made a wrong assumption. I have been drinking black tea all my life. I don’t care for green tea, but lately have put both black and green in a glass continuously through the day. Hoping to be able to get the nutrients from the green tea. they are both organic now. Sounds like I need to put a pot of tea on the day before and drink it, and choose another due to floride. I have stage 4 kidney cancer. Is taking Chaga mushroom and the others I extract form just as good? Someone that had done heaps of research on Essiac tea gave me the name of Ojibwa Colorado. http://www.ojibwatea.com I received mine today. You can buy the ready made tea in Wholefoods or Pharmica. It comes in a brown bottle. If you take the tea tree times a day it is a bit pricy. I have a recipe to make it fresh from the dried materials, (cost effective). I have been drinking it for over 1/2 year. It helped a lot with my after radiation/chemo tail/hip pain. I have started to use Canabis oil, and my progress has speed up for the better. I guess I will know how it’s working after my next CTscan. Quality of life has dramatically improved for me. Rosemary. Go to Google or YouTube and type in Essiac Tea. You find all kinds links that will tell you all about the history and how to make it from scratch. Good Luck! I’ve received Trinity tea today from Costa Rica. It has ginger, turmeric +Pau d’Arco. Has anyone tried this tea at all? About a month ago I had a total hysterectomy. It is recommended that I take chemotherapy and radiation. I just had my first chemo on 6/6. There are now some questions about my right breast (mammogram on 6/9). In 2007, I had a lumpectomy on left breast. Any recommendations on foods and are any of these tea better than the other for my condition??? You should look at this website also phoenixtears.ca Rick Simpson is his name, you can find him on FB. I’m a stage 4 colon cancer patient. For the past two years I have done all the things pharmaceutical and DR advised stuff. There is great info on his recommendation, my oncologist did give his OK, I would have done it without anyway. The changes have been unbelievable great, so much so that I only realize now how crappy I felt for a few month. Anyway, my two cents. I would feel bad if I would not share this. I send you healing vibrations. We are new users of Chaga tea and we boil it and let it steep overnight before drinking it. How do you brew it?? Hi Kenneth where can i buy i by Chagall mushroom tea from?? dear Tera , you can order sublimated water soluble chaga mushroom extract at http://www.baikal-legend.ru we sell post boxes all over the world. dihydroquercetion will also help you. Has anyone tried the MSM Vitamin C cancer protcal? How often do you drink the tea and where do you purchase it? In Australia this bark is available from Superfeast.com.au They also have Chaga Mushroom plus other medicinal mushrooms …and Astragalus root powder. Heaps of great info as well.